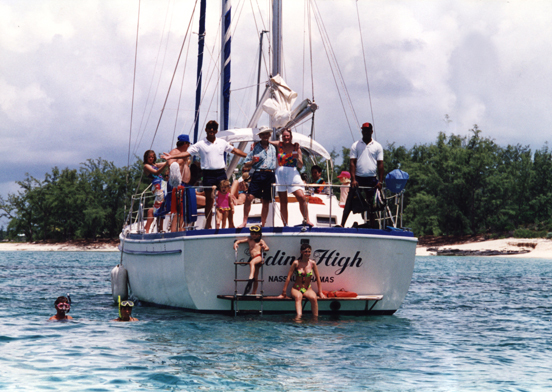 Enjoy the fantastic feeling of sailing - just picture yourself lying out on the deck, under the white billowing jib. Sunbathe on the deck, or sit in the shade under the sails or in the cockpit beneath the Bimini top. Listen to our great selection of music, to the wind, or to the waves lapping against the bow. 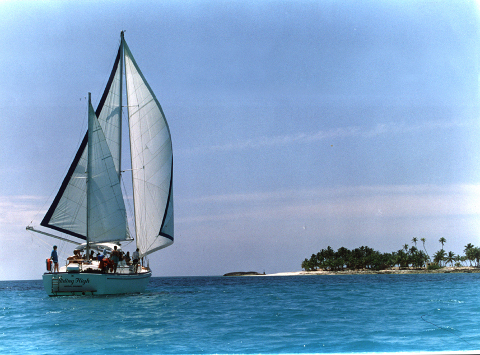 You'll find that sailing is the perfect vacation experience, like going to another world. 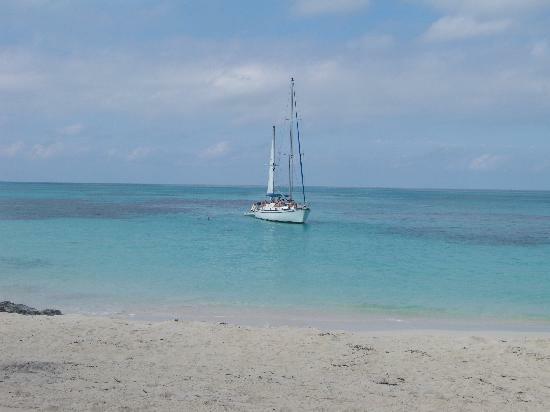 The most perfect day: enjoy great sailing and get away from it all to anchor at a secluded beach. Enjoy an amazing six hour cruise coupled with our famous Barbecue! 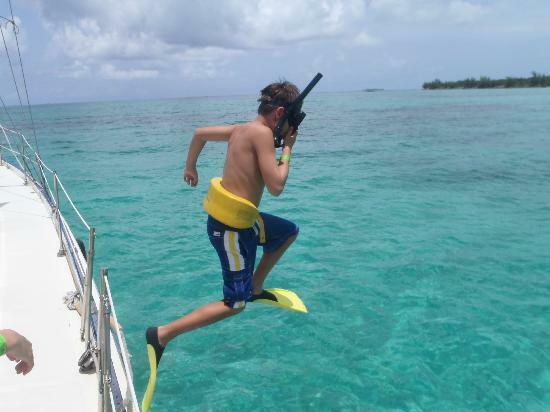 Snorkel in and around a coral reef and visit a secluded beach. This cruise includes about 3 hours of actual sailing time, and about 2.5 hours at a lovely secluded beach on nearby Rose Island (8 miles east of downtown Nassau). During this scenic cruise you will sail past several nearby islands, and have lots of time to unwind! While at the island spend your time, beaching, snorkeling, swimming in crystal clear water, or simply relaxing on your own sailing yacht! The snorkeling on this cruise is outstanding, you will get to see beautiful coral formations and a huge variety of colorful reef fish. Coffee and donuts are served in the morning, fruits and cookies in the afternoon, and a BBQ lunch is prepared to order while anchored alongside the island. Lunch consists of BBQ chicken & ribs, potato salad, coleslaw, and fresh rolls. All day long there is unlimited complimentary fruit punch, iced tea, lemonade and bottled water. Our delicious Bahamian Rum Punch is also unlimited and complimentary - during the entire sail back to the dock! This is the cruise we recommend the most, as it definitely is the most perfect way to spend the day! The trip departs at the captain's sole discretion. No refunds for bad weather will be issued unless Barefoot Sailing Cruises cancels the excursion. 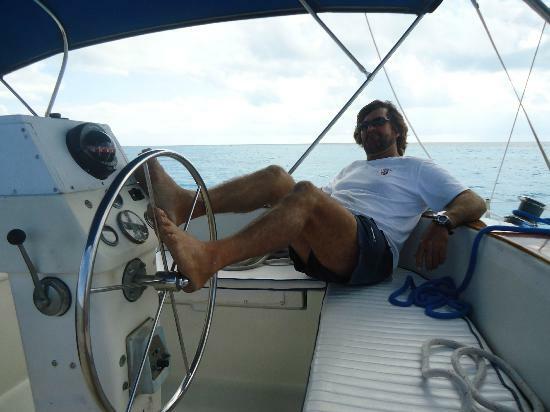 Barefoot Sailing Cruises reserves the right, under certain weather conditions, to omit specific portions of the program or to choose an alternate location depending on the condition of the ocean.